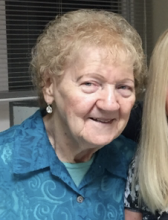 Eleanor Lorraine "Sis" Ketcik of St. John, IN formerly Oak Forest, IL, age 90, passed away Friday, March 1, 2019 and was reunited in Heaven with her brothers and sister whom she dearly loved: Tom and Ed Ketcik and Mary Ann Croner. She provided unconditional love as a second mother to eleven nieces and nephews, was a second grandmother to numerous great nieces and nephews and was everybody's "Aunt Sis". Aunt Sis was a lifelong Cubs fan who also had a passion for polka music and dancing. She brightened the world with her love, her baking and her infectious laughter and made everyone feel special. Aunt Sis will be missed by everyone who knew her. Eleanor worked as a switchboard operator/supervisor for Chicago City Bank. Friends may meet with the family Friday, March 8 from 6-8 pm at the FAGEN-MILLER FUNERAL HOME, 8580 Wicker Ave in St. John, IN. Funeral services will be at the funeral home Saturday, March 9 at 10:30 am. Burial Calumet Park Cemetery.